I still recall the construction of SKYCITY Auckland’s Sky Tower with some wonderment. It was fascinating to watch the progression from gaping hole to awe-inspiring majesty that today dominates the Auckland skyline for miles in every direction. Today SKYCITY Auckland can safely boast that it is New Zealand’s premier entertainment destination. Featuring two luxury hotels, a world-class casino, the iconic 328-metre Sky Tower, an enticing selection of restaurants, cafes and bars, free live entertainment, and the 700-seat SKYCITY Theatre showcasing the best local and international acts, there is certainly something to capture everyone’s imagination. If it’s 5-star elegance you’re seeking, then SKYCITY Grand Hotel is the place for you. Within the hushed luxury of the “Grand” as locals refer to the hotel, you’ll find exquisitely appointed rooms, a 25-metre indoor lap pool, state-of-the-art gym, the wonderfully rejuvenating East Day Spa and, situated on the ground floor, The Lobby. Voted one of Australasia’s top ten hotel bars, this lounge bar is a true inner-city oasis. For the ultimate, check into the Grand Suite on the 21st Floor where sweeping views of the Waitemata Harbour twinkle fairy-like by night and sparkle by day. Superbly appointed and proportioned, the suite boasts a large lounge and dining area, kitchen and butler’s kitchen, study with high spec office fittings, a large bathroom with separate bath and shower as well as a separate guest bathroom and all the amenities that you’d expect in 5-star splendour. That said, the standard Luxury King Room is no slouch offering refreshment bar, separate bath and shower, bathrobes and slippers, king-sized bed and those fabulous East Day Spa products. Alternatively, the 4+ star SKYCITY Hotel is currently undergoing a stunning refurbishment and is a great place to unwind. With 24-hour room service and a selection of restaurants and bars right on your doorstep, entertainment options just don’t get any better. Here the Premier Suite offers a spa bath and expansive city and harbour views, as well as easy access to the rooftop swimming pool, gymnasium and sauna. SKYCITY Auckland boasts 18 restaurants, cafes and bars. To try to describe all the choices here would be frivolous, but I’ll whet your appetite just a little … Treat your taste buds and visit award-winning restaurants such as the chic and elegant ‘dine by Peter Gordon’ or indulge in the sublime tastes and textures of Bellota, Peter’s modern take on a traditional Spanish tapas bar. The Sky Tower offers dining with spectacular views where you can sample New Zealand a la carte cuisine at the unique Orbit Revolving Restaurant, or you could try the sumptuous brasserie-style buffet specialising in local seafood at The Observatory Buffet Restaurant. Suffice to say that you certainly don’t have to venture far to find something delicious to eat. While on the subject of the Sky Tower, I should point out that, at 328 metres, it is the tallest man-made structure in New Zealand. 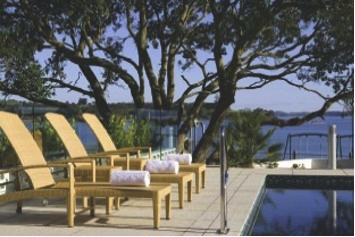 From here you can experience unparalleled 360º panoramic views across Auckland. There’s something unique about sipping on a glass of fabulous New Zealand wine or a freshly brewed coffee in the Sky Lounge – New Zealand’s highest cafe and bar. Now that’s a spot to write postcards home! If all that scenery from a height has gotten you thinking, why bother taking the elevator down when there’s a far more adrenaline buzzing way to do it. SkyJump will have you leaping 192m off the Sky Tower. And if you still haven’t had enough of a rush for one day, those up for the challenge will love SkyWalk, a 360° perimeter walk around Sky Tower’s 1.2m wide pergola. I can tell you that 1.2m sounds like a lot of width … until you’re up here! Okay, enough of this type of adrenaline – it’s time for thrills of another sort. SKYCITY Casino is open 24 hours a day. There’s a constant ka-ching as more than 1,600 of the latest and greatest gaming machines are played by punters trying their luck. 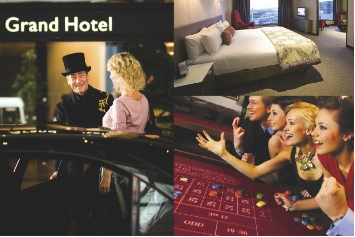 You’ll also find 100 world-class table games such as Roulette, Baccarat and, my favourite, Blackjack. I haven’t ventured into the newly-expanded Poker Zone yet, but there’s always tomorrow! It’s a buzz just soaking up the energy and atmosphere in the Casino. Sit at one of the casino bars and enjoy a drink while taking in the action around you – it’s constant, it’s vibrant. Most nights of the week you can enjoy free live entertainment at SKYCITY Auckland. You can dance the night away with live bands and DJs at Sammy’s Place on the Main Gaming Floor and at The Deck, on Level 3 of the Atrium. SKYCITY Theatre also offers a dazzling array of cultural and visual delights, from comedy acts to drama and dance, as well as the best local and international acts. ? ?Whether for the majestic views from the Tower, for the adrenaline rush of the SkyJump, the thrill of the Casino or the dining, entertainment and variety on offer, international visitors head to SKYCITY Auckland like moths drawn to a flame. Isn’t it time you discovered one of the Mother City’s most famous landmarks for yourself?